Today's tutorial comes to us thanks to Donna of Donna Inks. Donna is a Stampin' Up! demonstrator and recently attended a brayering workshop with Michelle Zindorf. This past weekend, Donna, Julie and I "got away" to a cabin at a local state park for girl time and "Stamp Camp." Donna shared some brayering tips with us and I was able to capture two of her creations in progress on my video camera. 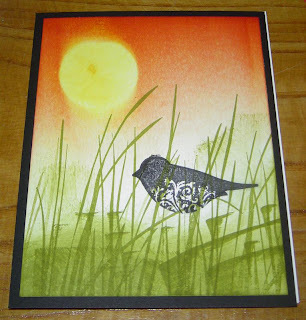 Use good quality smooth paper, like Stampin' Up! 's Whisper White. Georgia Pacific paper will not give as good a result. Use only dye or classic ink. Craft or pigment ink will sit on top of the paper and won't seep into the paper. Ink your brayer in one direction. Don't roll it back and forth on the ink pad. You want to get an even distribution of ink on the entire roller, all the way around, without any bare spots. Use a steady medium pressure - not too hard or too light. If you do end up with a line - don't worry. Use more ink and blend it in. 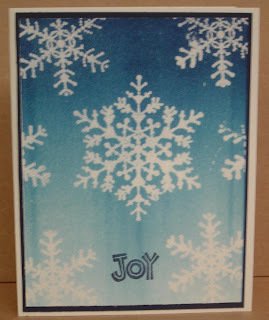 Here's a video showing Donna making these two beautiful sample cards. It's easier to see the brayer process on video than with still photos. Thanks again to Donna for today's tutorial! Please let her know how you liked the demonstration. If you have suggestions for future tutorials, or if you would like to submit a tutorial for a future Tuesday, please email kate@operationwritehome.org. 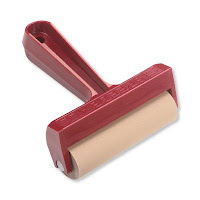 The roller is called a brayer. That particular brayer is a Speedball brand brayer, but there's nothing special about it, any brand would work. This is a beautiful technique and your video was really helpful!! I need to buy some Glossy Paper, so that I can try this again. I have all the other supplies and it's be fun to break it out. The cards you are all making are fabulous! !